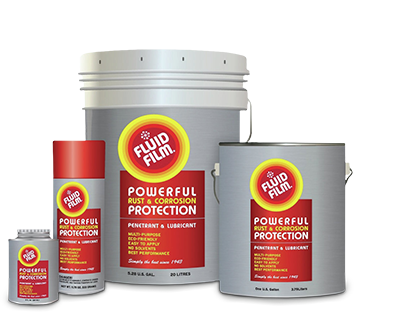 Fluid Film Liquid AR is a non-toxic, lanolin-based soft gel coating. It is used primarily in the heavy marine industry, and is useful in preserving parts in storage or during shipment. It is also used in the maintenance of aircraft, heavy equipment, and automobiles. Liquid AR can be applied using an airless sprayer, roller, brush or grease gun. Amber, soft gel. Lanolin-based coating. Solvent free. Non-toxic. Will not evaporate. Anti-corrosive coating, lubricant and penetrant for all metals. Used in heavy marine and general industry, particularly for ballast tanks and voids, chains, hoists, wire rope, winches, turnbuckles, conveyors, bearings, augers, drills, valves, linkages, scales, joints and zert fittings. Preserves parts in storage or during shipment. Used in the maintenance of aircraft, heavy equipment, and automobiles. Also used in refineries, salt plants, power plants and gas companies. Airless spray, roller, brush or grease gun. If this soft gel is to be transferred from its original container into a spraying device, it is desirable to break the gel's thixotropy by mechanical agitation. The agitation will convert the product to a more liquid consistency and make pouring feasible. If conditions dictate a heavier coating or lubricant, refer to other Eureka Chemical Company Product Bulletins for semi-liquids, gels and greases or consult Eureka Chemical Company. No sandblasting required. Remove flaking rust and peeling paint. Break all blisters larger than 25mm (one inch). Remove all standing water. Clean up all debris and silt. Residual coal tar and asphaltic coatings should be removed to leave a thickness of no more than 50 microns (0.002 inches). If sufficient time and/or funds are not available for ideal preparation, FLUID FILM LIQUID AR may be applied with less preparation or none at all. In this case, it must be remembered that the product will soften scale to the point where exfoliation is likely. While this provides a relatively inexpensive method of descaling, tanks should be inspected more often, perhaps every several months, to determine if scale and coating have fallen. If so, touch-up of bare areas; this should be accomplished as soon as practical. 681m 2 (7,330 ft 2 ) @ 305 Microns - 12 Mils - New Steel. None on neoprene and buna-n. May cause swelling on non oil-resistant rubber goods. Note 1: The use of anodes in tanks coated with LIQUID AR is considered an unnecessary expense and redundant to the purpose and function of the coating. Note 2: When welding in tanks coated with LIQUID AR, wipe material back a distance of 1.5 meters (5 feet) from where hot work is to be performed and from the deck area beneath the hot work. See Technical Bulletin #202.2. All components of FLUID FILM® LIQUID AR are listed on the TSCA Inventory. This document is subject to revision without notice.